We have some AWESOME Shows coming up! You won't want to miss these 2 shows ladies! Oh Sweet Sadie is the Most amazing show I've ever been to. Go check out their website! We will be at Noah's in South Jordan Fri. & Sat. this weekend (Nov. 14th & 15th) 9:30-8:30 Friday. 9:30-5:00 on Saturday! The address is 320 W. 11000 S. South Jordan. Just South of the 106th South Exit! Don't miss this Fabulous Show! 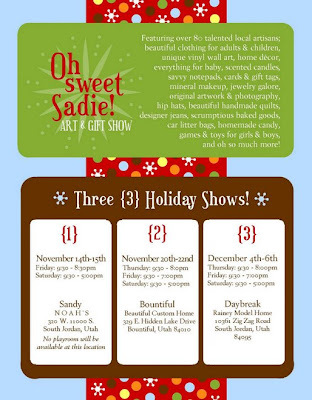 We will also be in Utah County this weekend! We will be here in Lehi! This is a fabulous show as well. Terri does an amazing job obtaining vendors for this Show. If you are going to head up to South Jordan for OSS be sure to stop by this cute boutique in Lehi at the Legacy Center on your way. It will be well worth the jot down main street.